On Saturday, I headed out to ride to Alpine, by the “back way”, not the route we will take on Friday. Climbed for 4 1/2 miles in hot sun, as the wind was blocked by the hills. Managed to keep pedaling in middle chain ring, not shifting down to “Granny” gear for the distance. Don had planned to meet me at the top, but I asked for extra time to bike part way back down, to enjoy the fruits of my labors. Bike 25 miles. Sites along the way included this Indian reservation with obligatory casino, and a boat that seemed quite out of place. Sunday we drove to Escondido where I climbed on my bike to follow an urban trail to Oceanside. 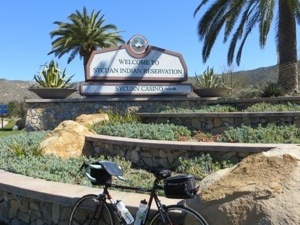 After meeting Don for lunch near the beach I opted for more miles, including a ride into Camp Pendleton. I managed to miss a turn and rode away from our meeting point. Thanks to our new IPhones Don was able to track my phone and drive to “rescue me”. Bike 38 miles. 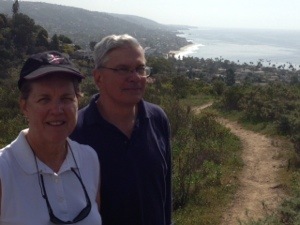 We continued on in the car to Laguna Beach to spend 2 nights with my college roommate Jan Kaplan and her husband Ken. They have a beautiful home with lots of glass and exquisite views of the beach. For cross training, on Monday, we hiked into the village for coffee then into the hills. 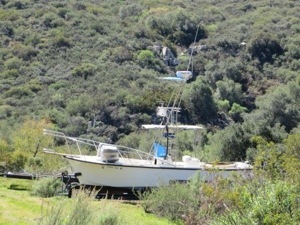 I was quite breathless with the uphills, but enjoyed wandering along the single track trails coming back to her house. The beach views along our hiking trail. 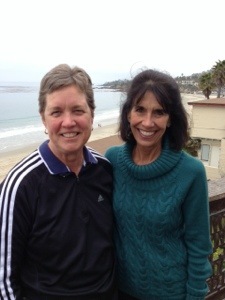 While Don played golf in the afternoon, Jan and I enjoyed the beach, too cold for swimming but plenty warm for relaxing. Friends for over 40 years! 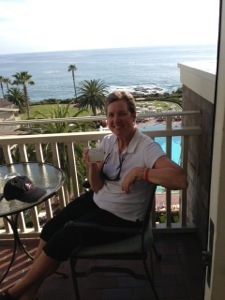 To complete my final preparations for my biking adventure, I enjoyed a margarita by the beach and pool at Montage, the 5 star hotel and spa in Laguna Beach. The biking, good friends, and a margarita – life is good. Sounds like you are getting in some good fun along with preparations for the ride. Jan looks the same as ever. You left Midwest just in time; we got nine inches yesterday, on top of six last week. Good luck.